One can only imagine the number and variety of musical influences Broadway, classical, jazz, rhythm and blues that surrounded Joel as he was growing up in New York City. Like Uwe and Jens, Joel began his musical career early in life, and “picked up” the bass at the age of 12. Like many musicians, Joel began learning music with classical training on the piano. After several years of piano lessons he switched to the bass and decided to devote all of his attention to playing the instrument. 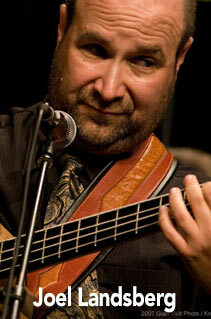 Joel has devoted his full attention to the bass ever since he first discovered his love of the instrument. Destined to find Uwe and Jens, in 1989 Joel moved to Switzerland and began a successful career as a bassist with various country/rock and jazz groups based throughout Europe. It was during this time that he met the Kruger Brothers and developed what would turn into a deeply rewarding musical alliance and friendship. In early 1995, Joel was initiated into the ‘Brotherhood’ and has been performing full time with the band ever since. For more information about Uwe, visit: http://www.KrugerBrothers.com.